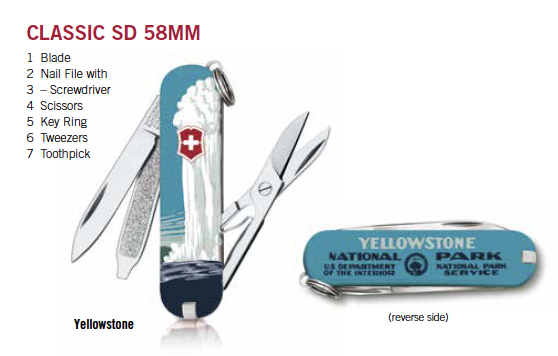 After being approached by Victorinox, we are now offering a line of WPA art-influenced Swiss Army Knives. This model, the Classic SD 58mm is their smallest, yet most popular knife and sports 7 tools. I've carried a prototype in my pocket now for one year and use it every day--even discovered an 8th tool--testing 18VDC power tool batteries. Don't try this--I melted the blade and handle! Seriously, this is always in my pocket now and joins my colletion of several other Swiss Army Knives. This model normally sells for $23.99 however, we're offering this as a special introductory offer (I sound like a care salesman, don't I?) for just $18.99. Currently we offer this in nine park designs (three not shown in our store are Grand Canyon, Joshua Tree and Everglades--artwork to be updated).